A Baltimore police officer, seen on video repeatedly punching a man, was charged with assault on Tuesday. 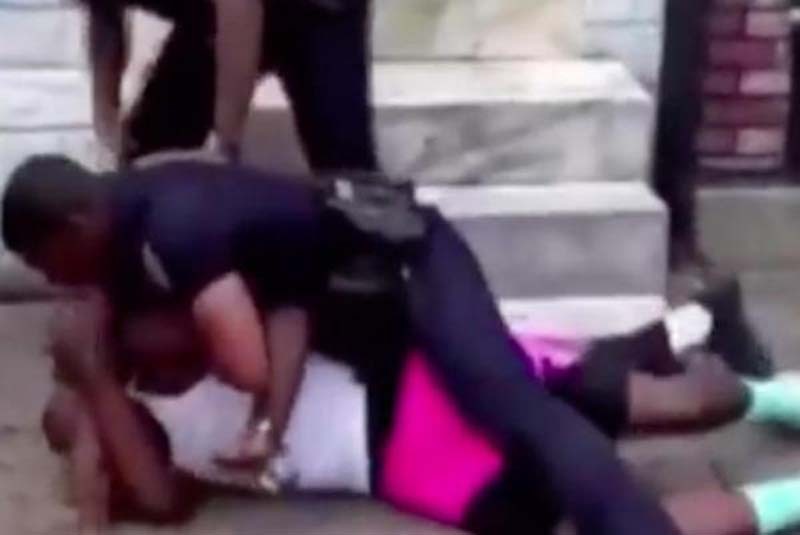 Baltimore State's Attorney Marilyn Mosby announced the officer, identified as Arthur Williams, was indicted on charges of first- and second-degree assault, as well as misconduct in office for beating 26-year-old Dashawn McGrier. Williams turned himself in to police and was taken to Central Booking Intake Facility for processing, chief spokesman for Baltimore Police Department T.J. Smith said. [post_ads]The first- and second-degree assault charges carry sentences of 25 years and 10 years in prison respectively. Mosby said the first-degree assault charge "fits this alleged crime" and requires proof that Williams "intended to cause serious physical injury in the commission of the assault," The Baltimore Sun reported. Williams was suspended and later resigned from the police force after video surfaced online of him pushing McGrier against the wall and pummeling him with a series of punches and knee kicks to the head. The incident escalated when McGrier refused to present identification for Williams to fill out a citizens contact sheet. The two had Williams had previously arrested McGrier for assaulting an officer, disorderly conduct, obstructing and hindering and resisting arrest in June and McGrier's attorney, Warren Brown said Williams unjustifiably targeted his client in both incidents. McGrier didn't fight back in the recording and Brown said he sustained a fractured jaw and ribs, swelling around his eye and ringing in his ears. Brown said the indictment was was unsurprising and appropriate and applauded Mosby for "doing the right thing." Mosby added no charges had been filed against the second officer in the video, who could be seen briefly grabbing McGrier's arm before backing away. "Our preliminary assessment of the available evidence has been that, in light of his responsibilities at the scene, there are no criminal charges that are appropriate," Mosby said.